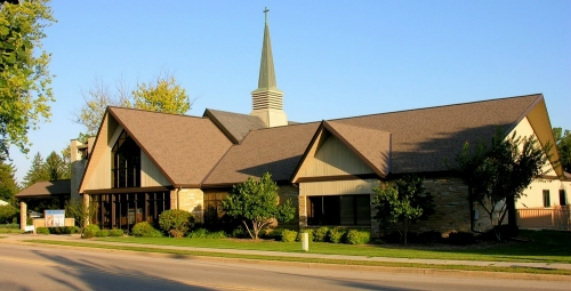 Notes: Immanuel Lutheran Church at 310 West Main Street, Mount Horeb, had its beginning in the mid-1800s, when German immigrants came to the present German Valley, a few miles southwest of Mount Horeb along Highway E, and the Erbe Road. About 1856 and later, ministers came from Madison to conduct worship services in the homes of the early settlers A small frame church was erected in 1868 on a hill. A parochial school was soon built and this building has been moved to the site of the old church and restored. In 1893 a larger house of worship replaced the early one. Thirteen years later this was destroyed in a lightning fire. 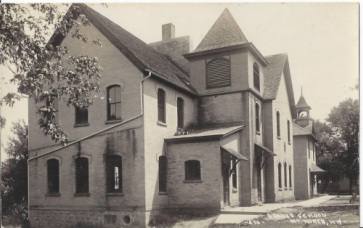 A new church was built in 1907 and was razed in 1952, after all services were concentrated in Mount Horeb. After 1913, occasional services were held in the Methodist Church at the Union Cemetery site as more of the members were residing in town. In 1919, the congregation purchased a public school on West Main for services. Six years later it was remodeled into a larger space. 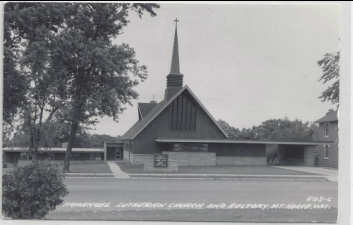 On July 31, 1955 the present church was built. Merged with East Blue Mounds Lutheran Church.